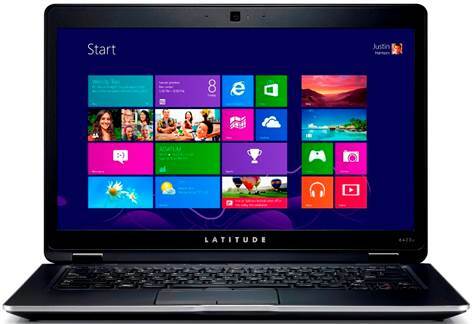 The Latitude 6430u has a sturdy form, an anti-glare display, high performance and a variety of ports. With the Latitude6430u, Dell has breathed a breeze of fresh air into the business latop series which are durable and sturdy but certainly bulky and heavy. Fully meeting all the requirements of the definition of Ultrabooks, Dell’s product is impressive with its slim and compact body yet being capable of maintaining the traditional characteristics. In addition, being shock resistant, having a spill-resistant keyboard and good specifications, the Latitude 6430u is the best choice in the price range of about $1,000. Our tested version is equipped with a 14-inch screen at the resolution of 1,366x768 pixels, the Intel Core i-3427U 1.8 GHz processor, 4GB of RAM, 128GB SSD, Intel HD Graphics 4000 graphics chip. Dell has not changed much in the overall design features of the Latitude series on this 6430u model with quite a few curved traits. Right on the top it is obvious to notice the prominent Dell logo on a black and gray background of the rubber cover which helps us hold the device more firmly. Though it is easy to leave fingerprint smudges on the cover but this product series does not expose as much as some previous models, for instance, the Lenovo Yoga, on which those smudges can still be seen even when viewed under the light. The entire chassis is made of solid magnesium alloy, which gives an entirely comfortable feel on our palms. The hinges are made of steel and they also have flexible mechanisms to help open the screen to 180 degrees in case there’s a need for presentation. On either side, Dell cleverly placed a bright chrome layer at the joints and tried to taper the whole body to the front to give a feeling of gentleness to the product. Weighing 1.81 kg, the Latitude 6430u is not so special compared to other models with similar similar screen size, such as the ThinkPad X1 Carbon with 1.48 kg and the HP EliteBook 9470 Folio with 1.63 kg. 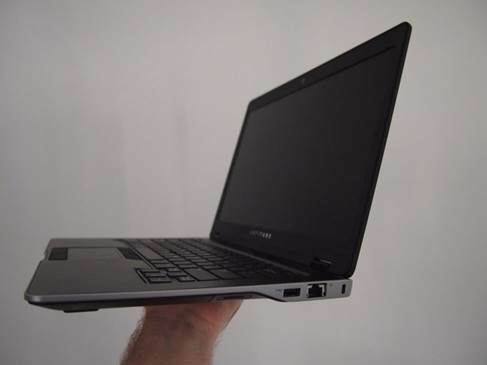 As for the thinness, this product has only just reached the right size according to the definition of thickness for Ultrabooks, with around 20.82 mm. However, thanks to that thickness, the device has all the ports and it also is one of a few current Ultrabooks that has such property. However, the most striking point of the Latitude 6430u to mention is that it achieved an award for its standard durability certified by U.S. MIL-STD-810G military including shock and damage resistance when dropped from a height of 0.72 meter, with vibration, hot temperature and high humidity in harsh environments with temperatures ranging from -10 degrees to 50 degrees Celcius. 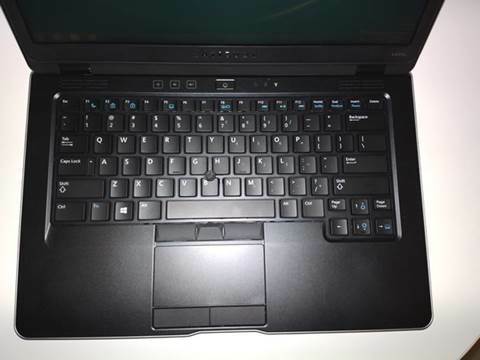 The accessories that come with the Dell 6430u are quite simple and the reason for this is that the device has already all ports of connectivity; there is no need for more jacks for LAN, HDMI, or VGA as in many other Ultrabook models. On the left are the power jack, VGA and USB ports, a 3.5mm headset jack and a switch to turn on/off Wi-Fi. On the right edge of the product are the kensington lock, LAN and USB ports. A vent slot is integrated into most of the area on the back of the device, along with the HDMI and eSATA ports, which is almost unique on current Ultrabooks. The keyboard is good but not backlit. Possessing a 14-inch display, the Dell 6430u does not have an extra number keyboard but the key size is standard and quite spacious. The navigation keys with big size are a significant plus for the product. Thanks to its moderately thin body, it gives a key journey that is not as short as on many other Ultrabooks, and the responsiveness is quite moderate though at the beginning you need to get used to the feeling that keys are a bit too heavy to press. The company placed shortcut keys and function keys together and moved the up/down volume out right next to the power button. Unfortunately, the keyboard is not backlit, which is often available on business laptops. In this model, Dell is still selling with the Windows 7 operating system pre-installed whereas the Windows key has the new logo of Windows 8. 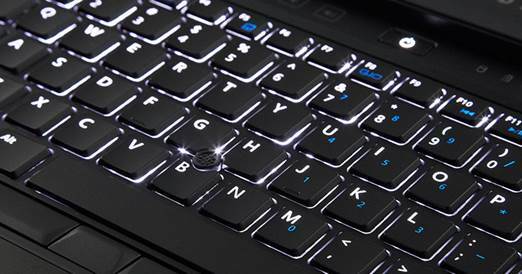 Though not having an excellent keyboard, the Latitude 6430u has a touchpad that can convince even the most demanding users. Moderate roughness for gesture recognition capabilities is very accurate and it is not slippery in use. Especially, multi-touch gestures works very well with the use of two fingers to navigate when surfing comfortably the Internet. The two mouse buttons below are quite good, giving a feeling of light touch and high sensitivity. As a business model, it also has a joystick lying between the G and H keys along with three mouse buttons on the touchpad. Just press lightly and move with very small force, the pointer on the screen continues to move steadily and accurately. However, the two mouse buttons that come with this joystick feel a bit heavy and when you press them down, the bouncing force is slightly uncomfortable. Aimed at users who prefer and appreciate good performance in completing jobs, the device’s speakers are not so excellent. Placed under the two plastic hinges, but the slots underneath may absorb dust after a certain period of use. Sound quality is fairly good with loud treble but still there is still a "cracking" feel while the bass is not really clear. It is sufficient to hear sound in a room of about 20m2 for personal entertainment. However, it is impossible to require the Latitude 6430u to be more powerful at this point. - Is 802.11ac Worth Adopting? - HTC Desire C - Does It Have Anything Good?